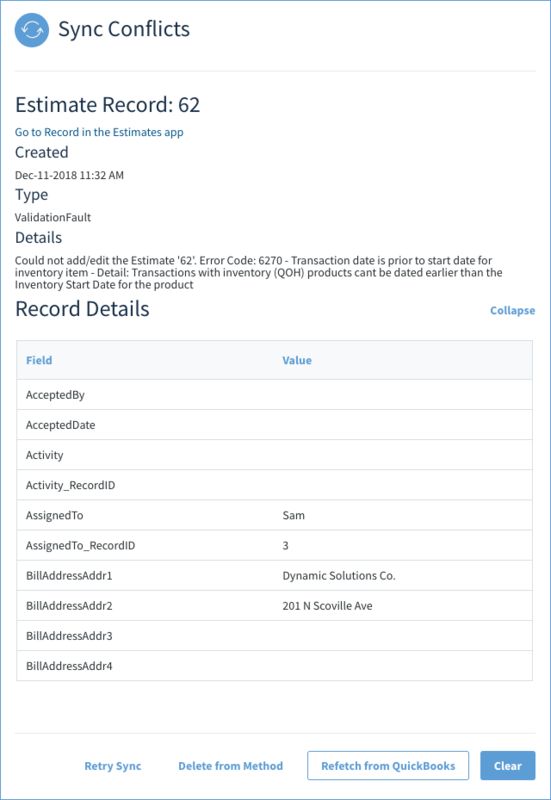 When a Method user has added, modified, or deleted data within Method, the Method Integration Sync Engine requests QuickBooks to do the same on its end. 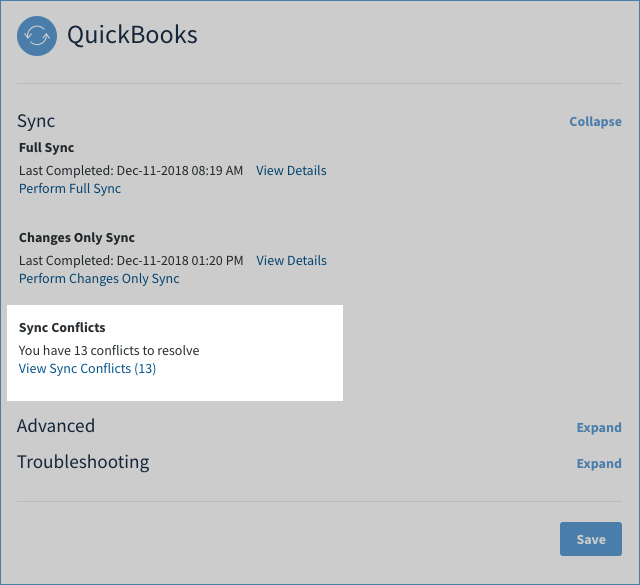 Sync conflicts can occur when QuickBooks receives this request but is unable to complete it, or simply rejects it. In these situations, QuickBooks usually provides a short description explaining why it was unable to complete the request, so Method can provide more information to the user about this record within Method. Do I have sync conflicts? Note: Administrative permissions are required to complete these steps. 1. Click the Gear in the upper right corner of the screen and then choose Preferences. 2. From the Preferences menu, choose QuickBooks. 3. If you have any sync conflicts, you will be shown how many underneath Sync Conflicts. 4. Click View Sync Conflicts. This will open a new screen showing all the conflicts. This opens the Sync Conflicts screen, which displays the details and descriptions of your current sync conflicts in a grid. 1. 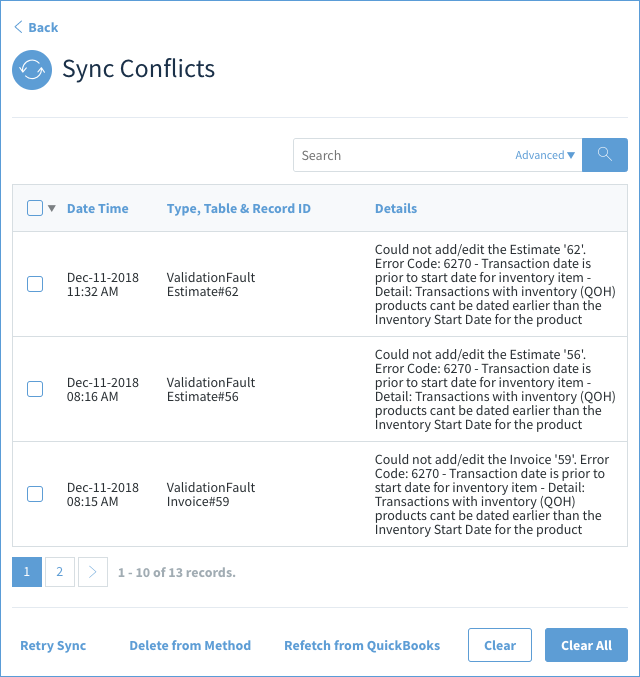 Follow the steps above to determine if your Method account has existing sync conflicts. 2. From the grid, select the sync conflict you would like to resolve. This opens a description of the conflict. 3. Click Go to Record in (app name) to view the conflicted record in its given app. Note: This allows you to access and alter the record directly, which can solve the conflict in some cases. 4. Some conflicts may have a Knowledge Base Article associated with it which you can find more information about in the help center. 5. Click Expand besides the Record Details to see more details about the record in question. 6. The buttons underneath give appropriate options to resolve the sync conflict (see below). Retry Sync: Re-attempts the sync. If the conflict has been resolved the conflict will no longer appear in this list. If the underlying issue has not been resolved it will reappear in the list. Delete from Method: Deletes the conflicted record from Method. In some cases, deleting may have caused the conflict in which case this will reappear in the list. Note: If the record is deleted, this action cannot be undone, so don't delete the record unless you're absolutely sure you don't need it. Refetch from QuickBooks: Attempts to fetch from QuickBooks. Note: This may override and replace the record in Method with the information saved in the corresponding record in QuickBooks. Clear: Temporarlly clears the conflict from the list. If the underlying issue has not been resolved it will re-appear in the list during the next sync. It is important to read the description from QuickBooks before you decide what to do with a conflict. 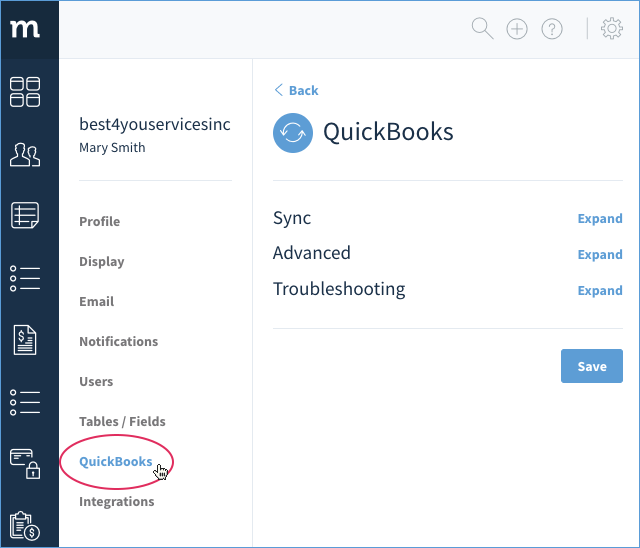 Another way to find out why QuickBooks rejected your request from Method is to perform a similar request directly within QuickBooks. This will usually cause a QuickBooks error or message that will explain why QuickBooks could not complete the request. Note: Method best practice says you should periodically check for sync conflicts on your account. Conflicts cause data inconsistencies between Method and QuickBooks, which may cause more issues down the road.